Now I will present the second deed and my readers will see why this little history lesson is important at this time. No money changed hands at this time, but the purchaser admits there is an obligation (the amount is not stated in the deed). Reference is made to the original deed being guaranteed by the original seller. Benjamin Morris is excusing Edward Marden from the usual obligation of guaranteeing his title. 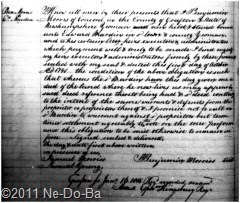 The deed is recorded 16-Jan-1815 (30 years later and the same day the first deed is recorded!). I am not a lawyer, so if anyone can see a problem with my interpretation of the deeds and events please use the comment box to straighten me out. It appears to me that Edward became disillusioned with the legal problems in Concord (Lisbon) and decided to get out of town. He had recently received a bounty certificate and perhaps it’s sale provided him with enough money to finance a move out of town. He may have simply walked away and given his deed to his neighbor in case things ever did get straightened out. Perhaps there is a second document (such as a bond) that has not survived which outlined what the obligation was. Perhaps they had a gentlemen’s agreement that Mr. Morris would pay Edward fair market value if title was ever properly confirmed. Lots of possibilities, but no clear answers at this time. Unfortunately, Edward’s wife is not represented in this 2nd deed. If alive, I believe she should have signed off on her “right of dower”. It certainly is disappointing, since discovering her name is extremely important to this project. Perhaps his first wife has passed away. If so, Edward would be raising a 5 year old on his own or perhaps had obtained a servant to care for his son and household. The 1790 Census (probably taken about June) suggested Edward’s wife was still with him (but it could be a servant or female relative) and the deed in October suggests the wife might not be with him. I should check in Concord (Lisbon) vital records for the possible death of his first wife in or before 1790.